WASHINGTON — After months of delays, NASA’s International Space Station-based Robotic Refueling Mission (RRM) last week completed the first of six simulated satellite-servicing tasks scheduled for this year, the project’s lead said. NASA began work on the RRM project in 2009. Engineers at Goddard built a custom set of satellite servicing tools and a mock-up spacecraft that includes valves, wires, thermal blankets and seals commonly found on commercial satellites. 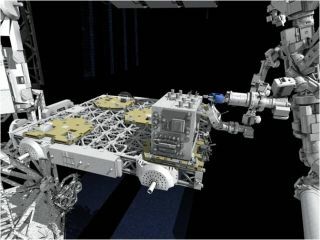 The Goddard-built tools are affixed to the space station’s Canadian-built robotic arm, and simulated satellite servicing is performed by a human operator at the Johnson Space Center in Houston. Between 2009 and its launch in 2011, NASA spent about $22.6 million on the project. The aim is to investigate whether robots can help extend the life of satellites that were designed to be disposable. Cepollina estimated that from start to finish, the first RRM demonstration, performed on March 6, took just over 28 hours to complete. Most of this time was spent ensuring that the servicing tools were ready for use, he said. The goal of the demonstration was to cut two safety wires. The first wire took about an hour and a half to cut. The second took about an hour, Cepollina said. A full report on the first RRM technology demonstration is in the works and will be presented at Goddard in the final week of May during the second International Workshop on On-Orbit Satellite Servicing. Five more RRM technology demonstrations are scheduled for 2012. The next will take place in May, when the RRM operator will attempt to remotely remove a valve assembly from the mock-up satellite. One of the higher-profile demonstrations is penciled in for July, when RRM operators will attempt to demonstrate robot-controlled satellite refueling. The project’s final demonstration for 2012 is slated for December, Cepollina said. Those dates, however, could slip, Cepollina said. The International Space Station this year is expecting to play host to the widest variety of vehicles ever to visit the orbital outpost. Besides Europe’s Automated Transfer Vehicle and Japan’s H-2 Transfer Vehicle, spacecraft built by the two U.S. companies NASA has engaged for space station cargo deliveries are scheduled to fly long-delayed demonstration missions later this year. Space Exploration Technologies Corp.’s Dragon cargo capsule is scheduled to launch no earlier than late April, and Orbital Sciences Corp.’s Cygnus freighter is to follow this summer. Both of these vehicles, as well as the Japanese vehicle, need assistance from the space station’s robotic arm to berth with the outpost. That precludes using the arm for other activities, like RRM. “A lot depends on visiting vehicles,” Cepollina said.